Eagle Mountain Saginaw ISD has 25 campuses in their district, and each campus utilized paper-based emergency plans. The school district also utilized radios, cell phone calls, emails, and the PA system for their safety communication needs, but none of those options allowed them to maintain a unified channel of communication throughout the district while connecting directly with local law enforcement. Eagle Mountain Saginaw ISD safety leaders liked the idea of granting staff members digital access to their emergency plans via smartphones and computers. As they explored the CrisisGo platform, they realized the value of having streamlined safety communication groups, emergency alerts, and a panic button. Grant digital access to their emergency plans for all 25 campuses in their district. Send emergency alerts and connect directly with first responders. Manage their school safety drills. 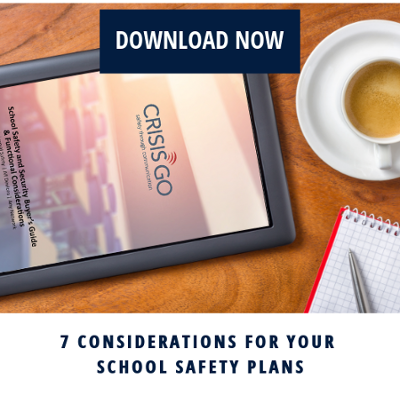 As an added benefit, CrisisGo’s school safety platform runs on Amazon Web Services, which ensures Eagle Mountain Saginaw ISD has the most reliable, secure, and redundant connection possible for their school safety needs. Eagle Mountain Saginaw ISD found value in granting easier access to safety information for their staff and being able to connect with first responders. Barry Baker, Director of Safety and Security for Eagle Mountain Saginaw ISD informed that when he rolled out CrisisGo to the district, local first responders wanted to be included in the platform. Baker also informed that they had a situation where a suspicious looking person was seen around an elementary school campus. The school staff used CrisisGo to give notice to the safety managers, which included some first responders. Baker stated, "Within two minutes, there were three squad cars along with me present at that campus to check into the situation." "Communication has been streamlined, and I love that first responders want to be a part of it."